Out in the wilds of North Devon, you might imagine that the opportunities to practise Aikido are few and far between. In fact, in the few miles between Bideford and Bucks Cross alone, you have a choice of no less than two classes. In the beautiful wooded valley of Bucks Cross, I teach the full range of Ki Development and Aikido techniques in the Village Hall (see here for more information). 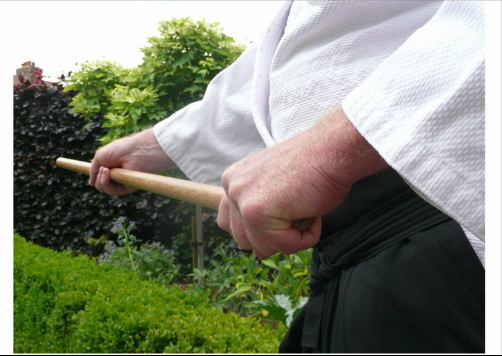 Meanwhile, in the town of Bideford, 3rd dan, Richard Small, teaches aiki-jo – the art of the wooden staff, derived principally from the teachings of Morihiro Saito, the founder of the Iwama school of Aikido. I went along to one of Richard’s classes last week and spent a thoroughly enjoyable two hours learning the basics of aiki-jo. In spite of having studied and taught Ki Aikido for more years than I care to remember, aiko-jo is completely new to me and I’m sure I make just as many mistakes as any other beginner (it’s always useful for a teacher to experience life as a beginner, by the way – my students can feel assured that when I practise aiki-jo, I feel their pain!). I won’t go into the details of the differences between the way we practise with the jo in Ki and Iwama styles of aikido. Suffice to say, the differences are considerable and students of Iwama Aikido devote much more time than students of Ki Aikido to the study of jo techniques and katas. Now, some Aikido teachers are very protective of their particular ‘styles’ of Aikido and don’t encourage their students to mix one style with another. There is a logic to this, of course. There are all kinds of subtlety of technique, style and attitude which vary from one school of Aikido to another, and switching between styles could risk confusing a beginner. But, fundamentally, Aikido is Aikido no matter what the ‘style’ and it is my view that we can all learn from one another. Moreover, since Richard teaches a specific aspect of Iwama-style Aikido (jo and bokken techniques) which don’t much overlap with the practice of Ki Aikido, it seems to me that the two arts are complementary.